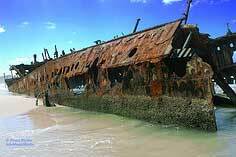 A major landmark of Fraser Island is the shipwreck of S.S. Maheno, she was originally built in 1905 in Scotland. 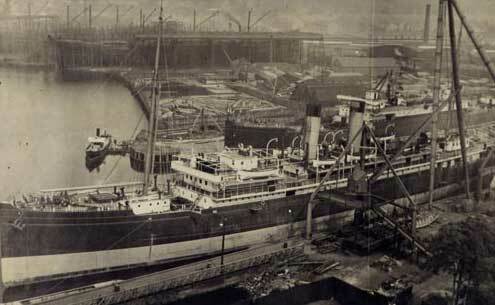 The shipyard William Denny & Brothers of Dumbarton, near Glasgow, was a major shareholder in the Union Steam Ship Company, and for 30 years built almost all its new ships. Dennys had a good name for its short-sea passenger ships and gave Union several cutting-edge vessels. Shown here being fitted out at Dennys in 1905, the 5,282-ton Maheno was a forerunner in the use of marine turbine engines. She made 17.25 knots on trials, but the machinery was not a success in service, and she had to be re-engined just before the First World War. 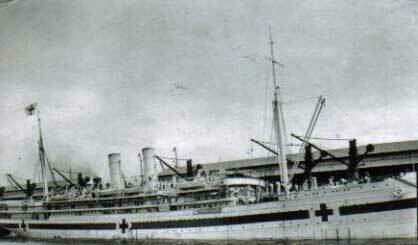 Maheno served as a hospital ship and as a trans-Tasman liner. A 5, 282 ton ship, destined as a luxury passenger ship for trans-Tasman crossings. during the First World War ship served as a hospital ship in the English Channel. 7 medical officers, 59 other ranks, 10 nurses. Capacity 340 cot cases. Expeditionary Force when it took control of German Samoa in August 1914. Evelyn Brooke is second from left in the back row. Evelyn Brooke was appointed matron in the hospital ship Maheno, which embarked for Turkey in July 1915. 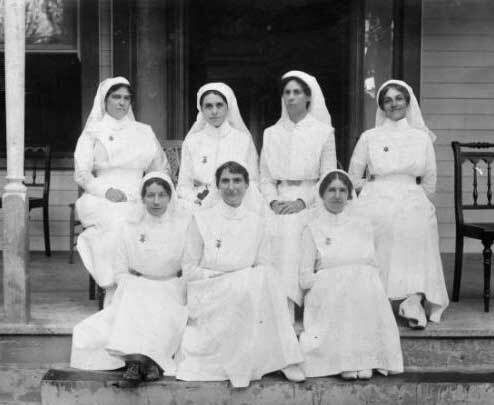 As a hospital ship matron, she was responsible for all nursing arrangements. Much of the work was carried out by male orderlies, whom she trained but were under the command of a non-commissioned officer (the wardmaster). Painting NZHS Maheno in WW1. Post war she returned to the Tasman run as a luxury liner. In 1935, the ship was declared outdated and on June 25th, 1935 the ship was being towed from Melbourne ( for scrap metal ) when it was caught in a strong cyclone. .The ship has since become severely rusted, with almost three and a half decks buried under the sand. Climbing on the shipwreck is not permitted. Wreck of SS Maheno on Fraser Island Queensland, Australia. Earl of Liverpool (Governor of New Zealand - Compiler). The New Zealand Hospital Ship 'Maheno'; The First Voyage July, 1915, to January, 1916. Whitcombe & Tombs, Auckland 1916. Earl of Liverpool (Governor of New Zealand - Compiler). The Voyages of His Majesty's New Zealand Hospital Ships 'Marama' and 'Maheno'; 2nd Volume. Whitcombe & Tombs, Auckland 1917. Earl of Liverpool ( Governor of New Zealand ) The Voyages of His Majesty's New Zealand Hospital Ships 'Marama' and 'Maheno'; 3rd Volume. Whitcombe & Tombs, Auckland 1918.